HOLLYWOOD /California Newswire/ — Starlight Children’s Foundation is currently auctioning off a VIP package for two lucky individuals to walk the red carpet and see popular television celebrities up close at this year’s All-Star Emmy® Award Show. Anyone can bid on two tickets to the Emmy Award Show on Sunday, Sept. 20 at the Nokia Theater in the heart of the exciting downtown complex LA Live and know that all of the proceeds will benefit Starlight’s seriously ill children and their family members. The auction is live now and will end on the evening of Sept. 2. Anyone can place their bid now to rub elbows with some of today’s biggest television stars at: www.ebay.com/starlight . 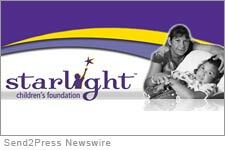 To learn more visit www.starlight.org .